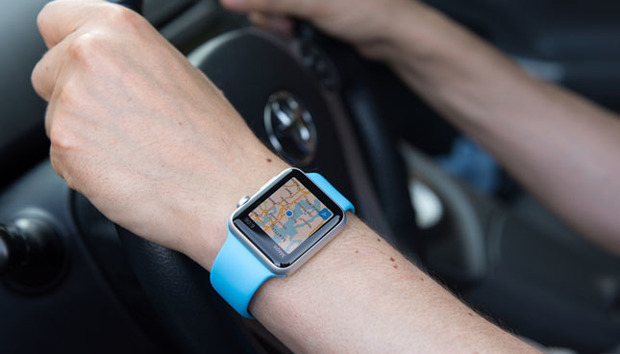 Will using your Apple Watch land you a traffic ticket? A Quebec man, Jeffrey Macesin, was trying to change the song he was listening to on his Apple Watch while driving through the town of Pincourt when he noticed the flashing lights of police car behind him. Once Macesin pulled over, he was charged under the Quebec Highway Safety Code for the use of a “hand-held device that includes a telephone function”. He was fined $120 CAD [$96 USD] and was saddled with four demerit points on his driving license. Macesin says he intends to fight the charge, claiming the Apple Watch is not a “hand-held” device and a number of Canadian lawyers agree that the law is unclear. According to Montreal traffic lawyer Avi Levy, the Apple Watch is considered a Bluetooth device and under the current law, there are no restrictions on using a Bluetooth device when behind the wheel. The law isn’t just unclear in Canada either. The National Safety Council (NSC), based in Illinois, issued an advisory in April when the Apple Watch was released warning drivers to switch the device off while driving. The Apple Watch isn’t the first smartwatch to hit the market but it is the most popular so far, drawing new attention to smartwatches and leading to more people wearing them compared to the original Android devices released over the last few years. In the UK, a study from the Transport Research Laboratory claims that a driver looking down at their smartwatch will have a slower reaction. This has fuelled calls in the UK for an outright ban on smartwatches while driving. Car safety firm SmartWitness is backing such a ban, according to its CEO Paul Singh. “With new wearable technology being devised all the time, [it is] going [to] create more and more distractions for motorists and it’s going to be hard for legislation to keep up with,” he says. Among SmartWitness’ proposal is for phones and other devices to come with a “Driver Mode”, similar to flight modes, which switches off calls and texts while the car is in motion. This is a legal grey area with a lot of broad definitions, according to Luis Rincon, CEO of Wearables.com based in Austin, Texas. Regulators are struggling to catch up with technology’s pace he says. Currently the law in Austin states that a driver may not use a phone, tablet, or “other device” to compose an electronic message. The “other device” reference leaves this very open and wearables could fall into this category. “I do believe that the laws need to be adjusted for wearables, as they are by definition hands free,” says Rincon, who believes that traffic tickets for using your watch isn’t the best long term solution. Given the vagueness of certain traffic laws on this matter, some lawyers are not convinced a ticket could stick. Block adds that a judge may very well rule that the device is no different than using a smartphone. Clarity is needed on this front. According to Michigan law firm, The Clark Law Office, there are a number of states attempting to change current statutes on distracted driving to encompass smartwatches, including Maryland, Illinois, New York, Delaware, New Jersey, West Virginia, and Wyoming. But these changes can be slow to move through the legislature, ranging from six months to a year, and these states are still only contemplating such changes, says Paul Clark, marketing manager. California, the home of many tech companies behind wearables, has traffic laws similar to many other states in the US and changes will need to be made to the law if smartwatches are to be banned, says California attorney David Coher. As Californian law currently stands, a driver is prohibited from using a handheld device, making calls (unless there is a hands-free component), and sending text messages, emails, and IMs. “In short, anything on an Apple Watch except sending or receiving a text, an instant message or an email is allowed under current California law,” says Coher. A second case in Fresno found that one man who was checking a map on his phone didn’t violate the traffic laws as he was not talking or texting and was just checking an app. “So, the next logic question is whether using the Apple Watch is prohibited by the anti-texting law, I believe that it is not for two reasons,” says Coher. With some devices being allowed and others prohibited, the “hands free” definition is put under a microscope and drivers will need to be wary of using these devices and the effects it may still have. Even if a driver is using a device lawfully, they may still be driving dangerously and could be pulled over and cited. “So while it’s important for drivers to know the law in their state, it’s critical that drivers use common sense when using their devices while driving,” says California attorney, Teri Karobonik from New Media Rights.